Go check out Dean's blog today for thoughts on this, I won't be stealing the idea. I'm just going to post my picks. To be perfectly honest, these choices don't reflect my personal preferences, but rather what I believe the results would be. I'm already screwed on a couple of them unless voting swings radically. 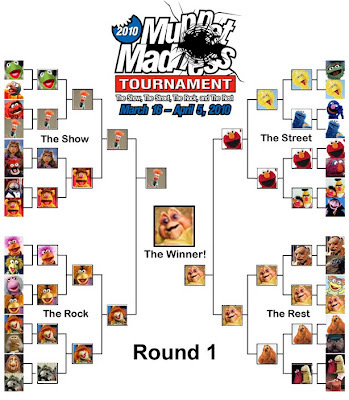 I sort of assumed the people most likely to respond to this polling would be too young for Grover and would have some sort of unnatural attraction to Beaker as a meme. Somehow I also thought Emmet Otter's Christmas special was way too old for most voters. The real upset is a lack of votes for Baby Sinclair. I seriously expected him to take the whole show after a tough semi-finals round. Right now he only has 37% in the first round of voting. If he loses I'm completely done. Que sera. You can vote and make your own brackets here. Of course they won't look nearly as nice as mine. I used Photoshop.